I photographed Bill and Marla’s wedding earlier this year. They were a ton of fun, so when Marla sent in a drawing request for her husband’s birthday gift, I was really excited to see what she had in mind. 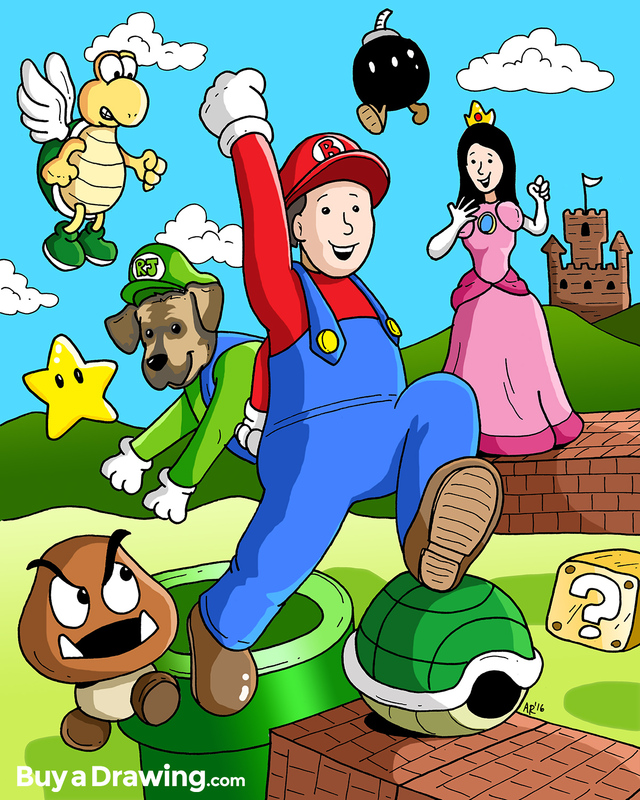 When I read the request and saw that she wanted Bill and their dog drawn as Mario and Luigi from the Super Mario Brothers video game series, I about lost my mind with excitement. Being a child of the 80s, I grew up playing all of the Super Mario video games on Nintendo, and have passed on that love of the series to my daughters. My brother and cousin still get together every so often and play a few hours worth of Mario Kart (N64 version…there is no other to consider). When I got to work I suggested that I draw Marla in the drawing too as Princess Peach. Bill pictured with his birthday gift…a framed Super Mario drawing courtesy of Buy a Drawing! Buy a Drawing is a custom drawing and cartoon service provided by illustrator / cartoonist Aaron Riddle. With over 15+ years of cartooning experience, Aaron will draw a black inked hard copy drawing or a color digital drawing of whatever you like. Buy a Drawing also offers original creative greeting cards created, design and illustrated by Aaron Riddle. By placing an order, the buyer agrees to the Buy a Drawing shop policies. ©2019 Buy a Drawing · All Right Reserved.